BINGHAMTON, NY -- The holiday season is usually a season for joy. We spend time with loved ones, reflect on the year that has come and gone, and give thanks for all that we have. For many people, it is also a time to give back to their communities, whether it is by volunteering time or giving money. This year, the Binghamton Jr. Senators fed their desire to give back to the community in multiple ways, planning events and service projects to help those in the Binghamton area. The first of those three service projects was a food drive leading up to Thanksgiving week which Binghamton Jr. Senators coach Anthony Langevin called “Hockey for Hunger”. Players from all three Jr. Senators teams, Jr. A, U16, and U10, paired up to go door-to-door and collect non-perishable food items. Some of the Jr. Senators traveled as far west as Elmira, with others hitting greater Binghamton area cities such as Vestal, Endicott, Endwell, Johnson City, Chenango Bridge, and others. All of this was done to help the Community Hunger Outreach Program (CHOW), an organization established in Broome County to help combat hunger in the Southern Tier region of New York. After several days collecting non-perishables, the Jr. Senators collected over 3,500 pounds of food and delivered it to the CHOW warehouse for distribution. The efforts of the Jr. Senators go a long way in helping CHOW fulfill their mission of helping those less fortunate, as their 3,500 pounds of food brought the yearly total of food gathered by CHOW to 13,558 pounds (as of the publishing of this article). While Langevin is proud of the work his teams did in collecting food for CHOW, good luck getting him to hid his pride for the Jr. Senators’ work with the Ice House Hawks, a team from the American Special Hockey Association. The Ice House Hawks are a hockey team based in Chenango Forks, NY that welcomes children of all abilities and needs to take to the ice. They hold weekly practices and play events and garner support from area hockey organizations, including everyone from the Jr. Senators, from the coaches to the players. Jr. Senators coaches and players attend practices each week to help out where they can on the ice. It is a rewarding experience for everyone at the Jr. Senators and their involvement goes a long way with those members of the Ice House Hawks that they help. As an added bonus for their involvement with the Ice House Hawks, the Hawks players and their families have become some of the Jr. Senators’ biggest fans this season, attending most, if not all, of the team’s home games. The support does not go unnoticed either. One way to give back is to use your talents to better someone else’s life. Musicians holding concerts, professionals offering services in their field of expertise, and people preparing meals for those less fortunate, are some of the many examples out there. What does a hockey team do when they want to use their talents in the same way? Well, they hold learn to skate classes which is exactly what the Jr. Senators, in conjunction with their home arena, the Ice House Sports Complex, are going to offer come January. Details for the program are still being finalized, but Coach Langevin is hoping that it attracts interest from people of all ages, from toddlers to adults, and people from outside the Binghamton area. While details will be announced in the coming weeks, what is known is that one night a week, people will be able to join the Jr. Senators and skate for free at the Ice House. More information will be announced in the coming weeks, so make sure to keep an eye out if interested. So why would the Jr. Senators’ organization put so much of an emphasis on giving back to the community? To Langevin, the answer is pretty simple: because they can. 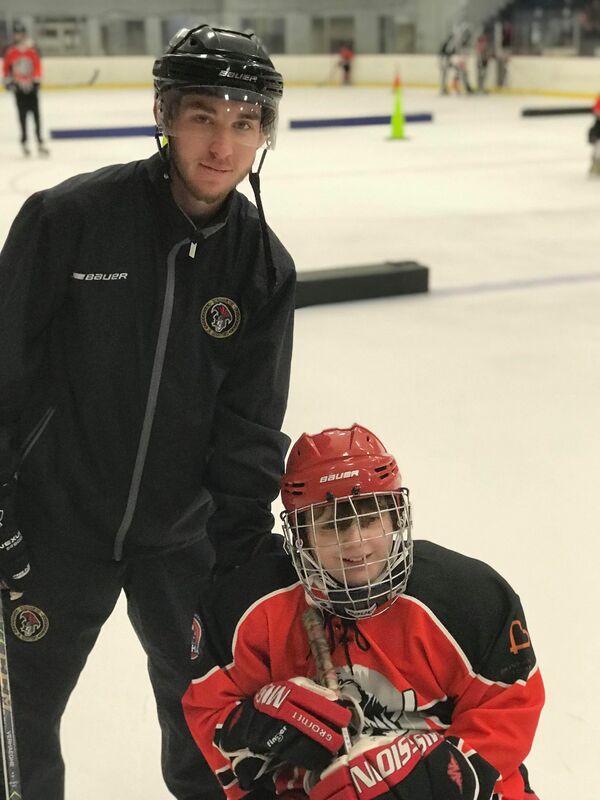 Coach Langevin knows that by making community service a focus for his players, they become more than just good hockey players, they become good men. Langevin is also quick to point out that many of his players come from fortunate backgrounds, making it a priority to give back when possible. The people of Binghamton have rallied behind the Jr. 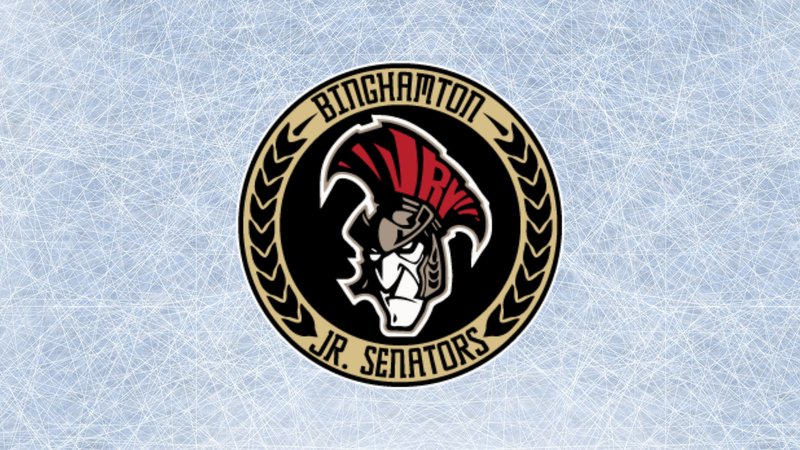 Senators this season as the team is averaging 409 people in attendance per game, which ranks 11thin the NA3HL and is a large increase from last year’s total. And give back is what they’ve done. Members of the Binghamton Jr. 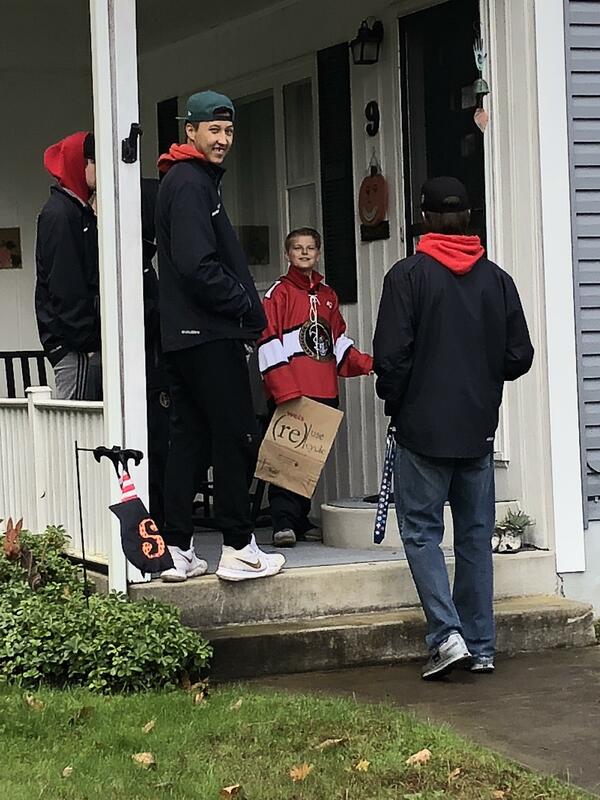 Senators organization team up to go door-to-door collecting non-perishable food donations from neighborhoods in the greater Binghamton area for their “Hockey for Hunger” campaign earlier in November. The Jr. Senators give their time helping kids from the Ice House Hawks during their weekly practices.